Aprils over already, this years going by way to fast for my liking. Anyway I have gathered a few things I’ve been using and enjoying this month, enjoy! Ps – Thankyou SO much for 50 followers on bloglovin’ it means a lot to me, I hope you all keep enjoying my blog. No7 Stay Perfect Eyeshadow Stick in ‘Cool Mink’ – I’ve mentioned this in my ‘Brand Focus’ post, which you can read here. This is the most gorgeous purple brown toned shadow stick, which is super cream and really blendable. If you’re looking for a budget alternative to the By Terry Ombre Blackstar shadow sticks, these are the one to go for! Will be using this well on into the summer. Max Factor Creme Puff Blush in ‘Seductive Pink’ – These have been a real hype the past few months and I managed to finally pick one up. I’ve done a whole post dedicated to this, (shameless self promo sorry) you can read that here. This is the perfect pink for spring time, and just gives a lovely glow to your cheeks. Also lasts super long, which I love. Similar to the Hourglass Ambient Blushes I believe, also the Milani baked blushes too. 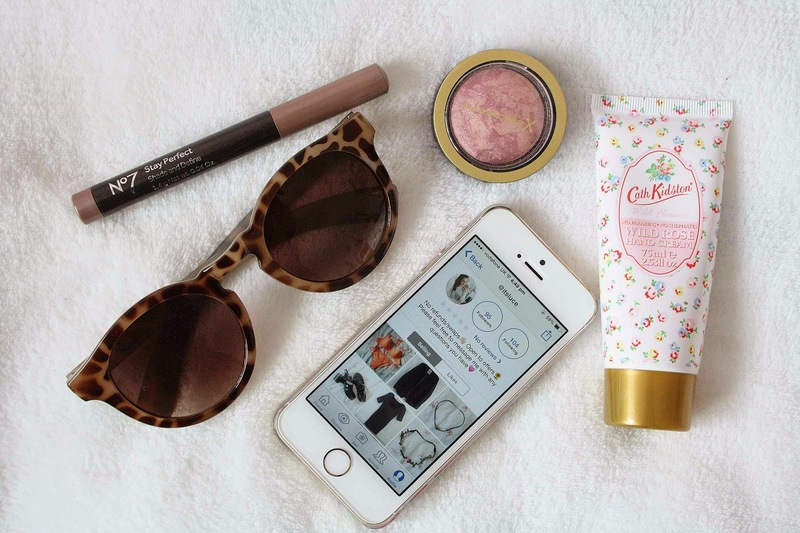 Cath Kidston Hand Cream – I love this hand cream. At the end of the day when my hands are feeling a little bit dry I just reach for this. Its not sticky what so ever, and sinks into your hands so nicely so you can quickly get back to your phone or laptop, haha. It smells like roses as well which is really lovely and reminds me of summer time. Primark Animal Print Sunglasses – Every year I’m on the hunt for a new pair of sunglasses, I usually go to Primark as they have such a good selection for such a bargain. These were only £3, and I’m in LOVE. I love the animal print, and I’m a big fan of rounded sunglasses. Since its been so sunny recently I’ve been wearing these so much. Such a bargain for such a lovely pair of sunglasses. Depop App – I’ve literally been obsessing over this app this month. Depop is an app where you can sell your old stuff, things you don’t want, clothes, makeup, electricals, anything you care to think of! I’ve been trying to sell some clothes that I’ve hardly got any wear out of, and I also love browsing through other peoples Depops to see what they’ve got to offer. If you want to check that out, my user name is ‘@itsluce’. I’d recommend this app if you’re trying to make a bit of money.